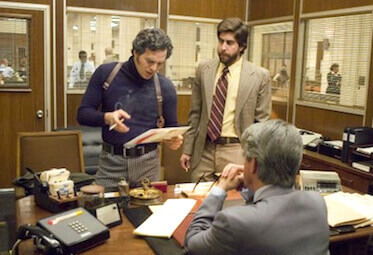 From the Paramount and Warner Bros. feature film “Zodiac”—San Francisco Chronicle reporter Duffy Jennings (right), as played by Adam Goldberg, with SFPD Homicide Inspector Dave Toschi, as played by Mark Ruffalo. 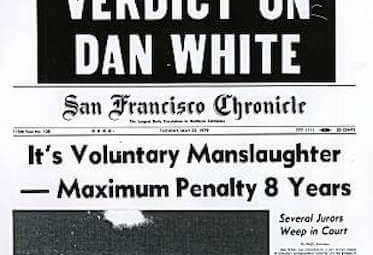 As long as he was healthy, every October 11 for more than 45 years, retired San Francisco police homicide inspector Dave Toschi left his house in the Sunset district and drove across town to Washington and Cherry Streets in Presidio Heights. There he spent time commemorating the anniversary of the fateful Saturday night in 1969 that the notorious serial killer calling himself Zodiac murdered cab driver Paul Stine and changed Toschi’s life forever. “I always park exactly where I parked the radio car that night,” Toschi told me one day several years ago. “I look around the intersection and I wonder what the heck happened. Did we cover all the bases? Did we miss anything at the scene? As a crime reporter for The Chronicle, I worked closely with Toschi and his partner, Inspector Bill Armstrong, on Zodiac and other cases, and I kept in touch with him over the years. Even in his 80s, Toschi still recalled that night in precise detail. He and Armstrong had been on call all week and had already worked three murders, including one the night before. “I was exhausted,” said Toschi. “I went to bed around 8 o’clock. The phone rang at 10:15. I remember exactly what the dispatcher said: ‘You’ve got a sloppy one near the Presidio. Cab driver shot in the head.’ I got dressed and went to pick up Bill in Parkmerced. The Stine killing was the only time Zodiac ever struck in San Francisco. Toschi retired in 1987 after 34 years on the force, including 12 in homicide from 1966 to 1978. He worked on at least a hundred murder cases, including the Zebra killings and others with notoriety, but none as compelling, frustrating or infamous as Zodiac. Toschi gained notoriety of his own for his trademark upside-down shoulder holster, his bow ties, his tan trench coat and the ever-present animal crackers he snacked on. Steve McQueen modeled his SFPD detective character in “Bullitt” after Toschi. Actor Mark Ruffalo portrayed Toschi in the 2007 feature film, “Zodiac,” based on a book by former Chronicle editorial cartoonist Robert Graysmith. Anthony Edwards of “ER” fame played Armstrong, who retired from the police department in 1977. Also in the film, Jake Gyllenhaal played Graysmith and Robert Downey Jr. played the part of my Chronicle colleague, Paul Avery. Adam Goldberg portrayed me in a brief role as the reporter who took over the case when Avery left the paper. I wrote about Zodiac’s last known letter to The Chronicle in 1978. Graysmith’s book and the film focus on one man, Arthur Leigh Allen, as the prime suspect in the case. Toschi said Allen was the “best suspect” he ever investigated. But Allen ultimately was ruled out by fingerprints, handwriting samples and DNA and was never charged in connection with any Zodiac killings.